The HDS-14LSX is the sturdy beast you want as the backbone of your shop; especially if you specialize in servicing larger, low ground clearance vehicles. Their alignment system features front turn plates and rear slip plates built right into the runways. The wheels always respond to your adjustments with no resistance or hassle. BendPak calls it “free floating.” You’ll call it unbelievably easy. 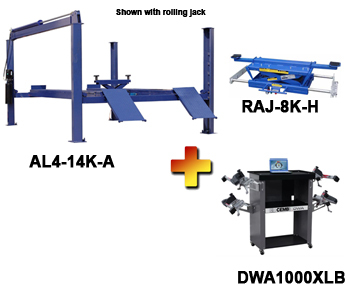 The CEMB DWA1000XLB wireless basic wheel alignment system utilizes 8 Sensor CCD Technology and MEMS static accelerometers, providing the latest in measuring technology. These optional, 7,000Lb. 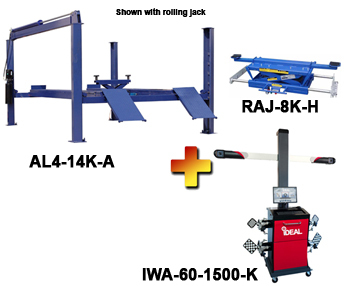 capacity rolling bridge jacks offer the ultimate in jacking speed and convenience. Their exclusive telescoping roller design allows the runways to be adjusted for different tread widths. Precision rollers enable you to position them anywhere under the vehicle. Perfect for wheel and suspension work. Each jack comes complete with stackable pad adapters and axle support plates. 7,000 LBS Automotive Lift with open center.